This spacious second floor unit features 2 Bedrooms, 2 Baths, Living Room, Dining Room and a Brand New Kitchen. 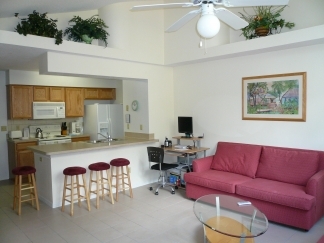 Ceramic tile throughout, new carpeting, new furniture throughout and Wi-FI High Speed Internet! Living Room has 27" Flat Panel TV with DVD Player, Master bedroom has queen-sized bed, walk-in shower, walk-in closet, 30-inch Wide-screen TV, DVD Player, and sliding doors leading to a small deck out back surrounded by trees and woods. Second bedroom has two twin beds, TV, walk-in closet, and access to second bathroom with tub and shower facility. New Kitchen is fully furnished. Living and dining room are furnished with couch, chairs, table, TV, DVD Player, computer and internet. Walking distance to the Clubhouse where there is a game room with play station, pool table, and workout/exercise room. Do not forget the pool! Also there is a hot tub, playground, barbeque area, and tennis and volleyball courts! The Clubhouse is open daily from 8 AM to 11 PM. 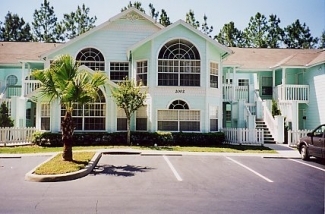 Convenient to the airport, all major highways and US 192 with plenty of shopping, restaurants, golf courses and miniature golf and "Old Town." Cleaning fees waived on stays of 8 nights or more. We do not charge a security fee. 0.00 deposit due on booking, balance due 60 days prior to arrival. All fees plus 13% sales and lodging tax..